Thinking of ways to spice up your website design so that it stands out from the pack of mediocrity easily? To crush your competitors, why not try out some excellent gradients that challenge your originality as a designer. Don the creative cap and shake up some stunning gradients that not only add seasoning to your website design but also help attract more visitors. 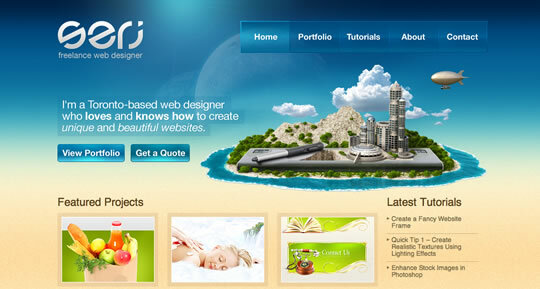 serj.ca: Undoubtedly an enticing piece to admire, this website design is sure to attract visitors spontaneously. The combination of warm colors makes it a delight to bank on. Brilliant play of gradient with shades of blue and yellow provides the website with a radiance that has a brightening feel. Ectomachine: Nothing beats the classic combination of black and white. An all time favorite among designers, the use of white with light shades of black towards the bottom makes the prime attraction of the website. Added to this, the designer has used some dynamic color effects of blue and white to make it distinctively unique. Icebrrg: Watch out for the brilliant use of gradient in this website where blue is used at its brilliant best. The lightening effect at the top of the site illuminates the beauty of the creation. Simple yet elegant, this website design celebrates the beauty of gradient in a sober way. 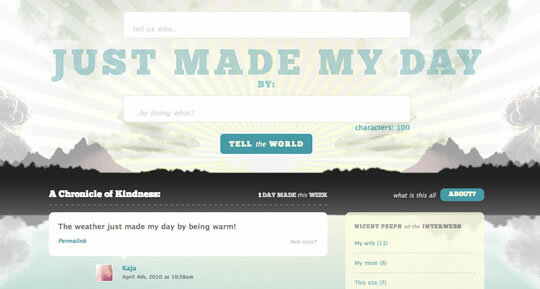 justmademyday.com: This website with its subtle and gracefully creative gradient is sure to make you feel really great. Adding a new dimension in the creative field of website design, Just Made My Day comes with an illuminating background. These are really good. This actually inspired me to make websites using gradients because I usually use plain black or any other color. Thanks for sharing!